Just having and maintaining your Facebook business page isn’t enough anymore. 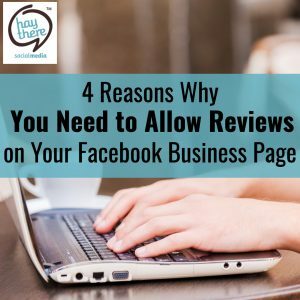 You also need to allow reviews on your Facebook business page. Consumers have more information at their fingertips than ever before, and you need to stay a step ahead of the competition. You can write anything you want on your own business website, touting how great you are and promising services and products you may or may not be able to actually provide – and consumers know that. You could be a one-person business – but with a larger-than-life appearance on your website that makes you appear to be the best thing since sliced bread, with a plethora of employees. You could claim to be a trusted business that has been around for 100 years, yet you really just started out last month. Consumers in 2018 are more aware that not every website contains the whole truth. That’s why you need to allow customers to leave reviews on your Facebook page! Prospective clients and buyers can see that real people have interacted with your business (maybe even some of their friends), and that you truly are what you say you are. The more transparent you are, the more credibility you gain. Having reviews from actual people on your business Facebook page allows everyone to see you are an honest company. Customers can talk about and share all aspects of your company: Actual products and their quality; services provided and how successful they are; and customer service aspects such as timeliness, courteousness, effectiveness, and responsiveness. Customers are much more educated than they used to be – and they have many more avenues to research you and other companies. If you don’t have proof from real people backing up your claims, they can easily find another company that does. While people can certainly go to a specific review site such as Yelp to read thoughts and interactions, you’re missing an opportunity to increase your transparency if you don’t allow reviews on your Facebook page – because more people are on Facebook, more often, than they are on Yelp. The more people who interact with your Facebook page, and the more often that they do, the more your organic reach interactions will increase – meaning your posts are actually being seen on newsfeeds without paying for ads increases. Facebook is always changing its algorithms on how certain posts will be seen. Quite often, those changes make it even more difficult for business pages to maintain an adequate organic reach, so you need every bit of interaction you can get. Plus, when people post on your page, leave a review, or share your page, their friends may see the interactions – and can start interacting on your page as well (or at least scoping things out a bit!). That’s why customers leaving reviews on your Facebook page increases your brand visibility. You may think you don’t want to enable Facebook reviews on your business page because you don’t want the world to see every little issue or concern customers may have – whether they are right or not. But, enabling customer reviews helps you to maintain control over your online reputation management! The key is responding to every review – and handling every complaint. Sure, someone can just as easily post something negative on your wall, or in response to a post you made. You may simply ignore a complaint posted somewhere else, but a potential customer could read that and it could get stuck in their head that you’re not a company they want to deal with. That’s why enabling Facebook reviews allows to you keep all those concerns in one spot – and that customers can see the issue has been handled. Customers are savvy: They know that things happen and not every reviewer is real or rational. But showing how you resolved – or attempted to resolve – an issue is key. After all, most people want to simply be heard and recognized. Responding to Facebook reviews allows you to fix problems or concerns with customers. First, always respond to such a review privately and immediately. Address the issue and determine the best way to fix it. Then, post publicly on the review that you have contacted the person and are working to discuss his or her concerns. Once you have taken care of the concern to the customer’s satisfaction, post a follow up response on the review to provide closure and show you were able to handle the issue effectively. Don’t go viral in a bad way by flying off the handle or getting snarky. If you are upset with a review, it’s OK to walk away. It’s also OK to outsource your online customer service (and Facebook reviews!) to a company like Hay There Social Media. We can manage your clients and customers in a professional and timely manner – freeing you up to grow your business! Responding to reviews on your Facebook business page and maintaining your online reputation management can be time consuming. Hay There Social Media has the knowledge and experience to take care of it for you – with you – to increase your brand’s visibility and provide additional customer service support. Contact us today to find out how we can help you!